Presentation: Presented in 2009 with mild stomatitis. Treated over the next four years with a combination of steroids, diet change, antibiotics, homeopathy and multiple pharmacologic analgesics as well as partial dental extraction. Patient also experienced feline hyperesthesia, constantly biting and chewing his skin, and was treated with amitriptyline as well. Complications from suturing these wounds and the placement of Penrose drains in his thinned skin resulted in further skin tearing. Despite extensive workup and therapies, Stewie’s stomatitis continued to worsen and by April 2013, he was anorexic and had experienced weight loss secondary to this. Additionally, he was withdrawn and painful and the owners were considering euthanasia due to his poor quality of life. Stewie was initially treated 2 to 3 times weekly, decreasing treatment frequency as his condition improved. 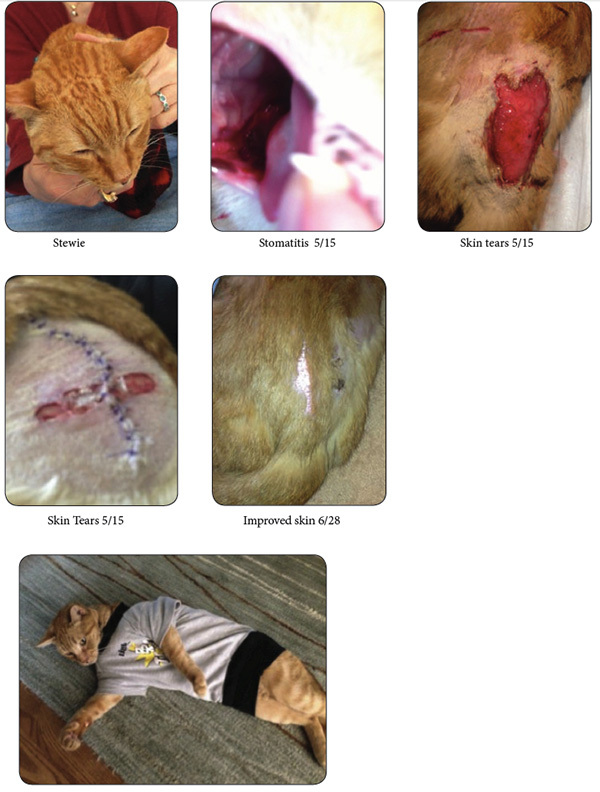 Treatment Results: By improving the quality of his skin and decreasing his somatic pain, his owners felt his improved quality of life justified further [dental] extractions. …Laser treatment following his oral procedures allowed the gingival, tonsillar and lingual lesions to heal.